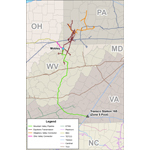 "This is an exciting opportunity to invest in a high-quality natural gas pipeline that we expect to be fully contracted for the next 20 years"
PITTSBURGH--(BUSINESS WIRE)--EQT Corporation (NYSE: EQT) and NextEra US Gas Assets, LLC, an indirect, wholly owned subsidiary of NextEra Energy, Inc (NYSE: NEE) today announced the commencement of a non-binding open season for the Mountain Valley Pipeline project, which is expected to connect Marcellus and Utica natural gas supply to demand markets in the Southeast region of the United States. The companies also announced the signing of a letter of intent to form a joint venture that is expected to construct and own the Mountain Valley Pipeline. Under the letter of intent, EQT is expected to, through one or more of its affiliates, including EQT Midstream Partners, LP (NYSE: EQM), operate the pipeline and own a majority interest in the joint venture. 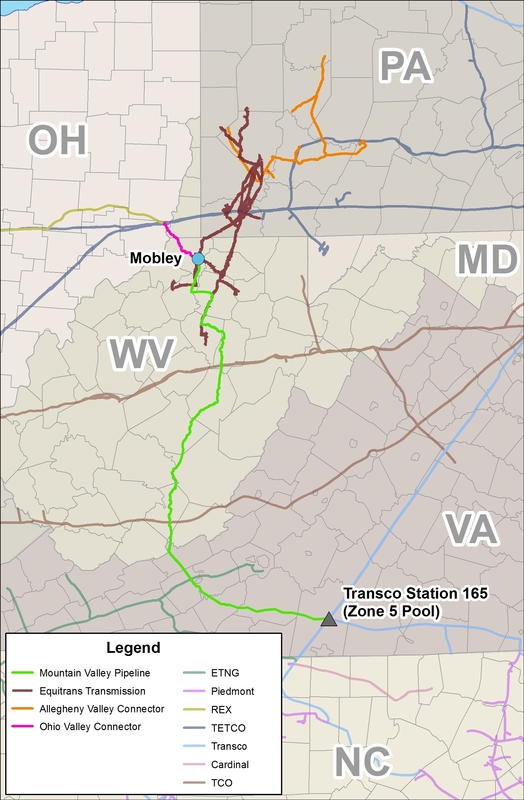 Subject to FERC approval, the 330-mile Mountain Valley Pipeline project will extend the Equitrans transmission system from Wetzel County, West Virginia; and travel south to its expected primary delivery point, Transcontinental Gas Pipeline Company’s (Transco) Zone 5 compressor station 165 in Pittsylvania County, Virginia. 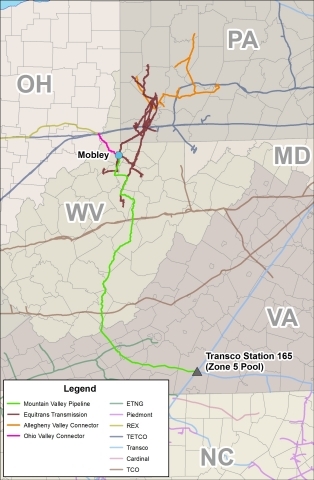 In addition to the primary delivery point, the Mountain Valley Pipeline has numerous potential interconnects with pipelines and processing facilities; and shippers will have the option to request a project extension to delivery points further south into North Carolina. The Mountain Valley Pipeline is expected to initially provide at least two billion cubic feet per day of firm transmission capacity. Including EQT, the open season has commitments from two foundation shippers that, combined, have agreed to one Bcf per day of firm transmission capacity through 20-year contracts on the Mountain Valley Pipeline. Delivery to Transco station 165 is expected to be in service by the fourth quarter of 2018. “By leveraging our existing asset footprint and extensive pipeline network, this project will provide Marcellus and Utica producers a unique opportunity to transport their growing natural gas production to the southeast, one of the nation’s fastest growing demand markets,” stated Randy Crawford, senior vice president, EQT Corporation; and chief operating officer, EQT Midstream Partners. The open season was filed by Equitrans, LP (Equitrans), a subsidiary of EQT Midstream Partners; however, the ultimate EQT affiliate to own and/or operate the pipeline will be determined at a future date. EQT is the general partner of and also owns a 32% limited partner interest in EQT Midstream Partners. The open season document can be found at www.eqtmidstreampartners.com. Consummation of the joint venture contemplated by the letter of intent is subject to finalizing definitive documentation and receipt of customary approvals, including board approval from each of the parties, including EQT Midstream Partners, LP. Disclosures in this press release contain certain forward-looking statements. Statements that do not relate strictly to historical or current facts are forward-looking. Without limiting the generality of the foregoing, forward-looking statements contained in this press release specifically include the expectations of plans, strategies, and objectives, including guidance regarding the expected terms and structure of the joint venture, including the EQT affiliates to own and/or operate the pipeline, and the expected length, capacity, delivery points and in service date of the pipeline. These statements involve risks and uncertainties that could cause actual results to differ materially from projected results. Accordingly, investors should not place undue reliance on forward-looking statements as a prediction of actual results. EQT has based these forward-looking statements on current expectations and assumptions about future events. While EQT considers these expectations and assumptions to be reasonable, they are inherently subject to significant business, economic, competitive, regulatory and other risks and uncertainties, most of which are difficult to predict and many of which are beyond EQT's control. With respect to the proposed pipeline project and joint venture, these risks and uncertainties include, among others, the ability to obtain regulatory permits and approvals for the pipeline, the ability to secure customer contracts for the pipeline, the availability of skilled labor, equipment and materials, and risks that the conditions to closing the joint venture may not be satisfied. Additional risks and uncertainties that may affect the operations, performance and results of EQT's business and forward-looking statements include, but are not limited to, those set forth under Item 1A, "Risk Factors" of EQT's Form 10-K for the year ended December 31, 2013, as updated by any subsequent Form 10-Qs. Any forward-looking statement applies only as of the date on which such statement is made and EQT does not intend to correct or update any forward-looking statement, whether as a result of new information, future events or otherwise. This press release contains “forward-looking statements” within the meaning of the safe harbor provisions of the Private Securities Litigation Reform Act of 1995. Forward-looking statements are not statements of historical facts, but instead represent the current expectations of NextEra Energy, Inc. (together with its subsidiaries, NextEra Energy) regarding future operating results and other future events, many of which, by their nature, are inherently uncertain and outside of NextEra Energy's control. Forward-looking statements in this press release include, among others, statements concerning adjusted earnings per share expectations and future operating performance. In some cases, you can identify the forward-looking statements by words or phrases such as “will,” “may result,” “expect,” “anticipate,” “believe,” “intend,” “plan,” “seek,” “aim,” “potential,” “projection,” “forecast,” “predict,” “goals,” “target,” “outlook,” “should,” “would” or similar words or expressions. You should not place undue reliance on these forward-looking statements, which are not a guarantee of future performance. The future results of NextEra Energy and its business and financial condition are subject to risks and uncertainties that could cause actual results to differ materially from those expressed or implied in the forward-looking statements, or may require it to limit or eliminate certain operations. These risks and uncertainties include, but are not limited to, the following: effects of extensive regulation of NextEra Energy's business operations; inability of NextEra Energy to recover in a timely manner any significant amount of costs, a return on certain assets or an appropriate return on capital through base rates, cost recovery clauses, other regulatory mechanisms or otherwise; impact of political, regulatory and economic factors on regulatory decisions important to NextEra Energy; disallowance of cost recovery based on a finding of imprudent use of derivative instruments; effect of any reductions to or elimination of governmental incentives that support renewable energy projects or the imposition of additional taxes or assessments on renewable energy; impact of new or revised laws, regulations or interpretations or other regulatory initiatives on NextEra Energy; effect on NextEra Energy of potential regulatory action to broaden the scope of regulation of over-the-counter (OTC) financial derivatives and to apply such regulation to NextEra Energy; capital expenditures, increased operating costs and various liabilities attributable to environmental laws, regulations and other standards applicable to NextEra Energy; effects on NextEra Energy of federal or state laws or regulations mandating new or additional limits on the production of greenhouse gas emissions; exposure of NextEra Energy to significant and increasing compliance costs and substantial monetary penalties and other sanctions as a result of extensive federal regulation of its operations; effect on NextEra Energy of changes in tax laws and in judgments and estimates used to determine tax-related asset and liability amounts; impact on NextEra Energy of adverse results of litigation; effect on NextEra Energy of failure to proceed with projects under development or inability to complete the construction of (or capital improvements to) electric generation, transmission and distribution facilities, gas infrastructure facilities or other facilities on schedule or within budget; impact on development and operating activities of NextEra Energy resulting from risks related to project siting, financing, construction, permitting, governmental approvals and the negotiation of project development agreements; risks involved in the operation and maintenance of electric generation, transmission and distribution facilities, gas infrastructure facilities and other facilities; effect on NextEra Energy of a lack of growth or slower growth in the number of customers or in customer usage; impact on NextEra Energy of severe weather and other weather conditions; threats of terrorism and catastrophic events that could result from terrorism, cyber-attacks or other attempts to disrupt NextEra Energy's business or the businesses of third parties; inability to obtain adequate insurance coverage for protection of NextEra Energy against significant losses and risk that insurance coverage does not provide protection against all significant losses; risk of increased operating costs resulting from unfavorable supply costs necessary to provide full energy and capacity requirement services; inability or failure to manage properly or hedge effectively the commodity risk within its portfolio; potential volatility of NextEra Energy's results of operations caused by sales of power on the spot market or on a short-term contractual basis; effect of reductions in the liquidity of energy markets on NextEra Energy's ability to manage operational risks; effectiveness of NextEra Energy's risk management tools associated with its hedging and trading procedures to protect against significant losses, including the effect of unforeseen price variances from historical behavior; impact of unavailability or disruption of power transmission or commodity transportation facilities on sale and delivery of power or natural gas; exposure of NextEra Energy to credit and performance risk from customers, hedging counterparties and vendors; failure of counterparties to perform under derivative contracts or of requirement for NextEra Energy to post margin cash collateral under derivative contracts; failure or breach of NextEra Energy's information technology systems; risks to NextEra Energy's retail businesses from compromise of sensitive customer data; losses from volatility in the market values of derivative instruments and limited liquidity in OTC markets; impact of negative publicity; inability to maintain, negotiate or renegotiate acceptable franchise agreements; increasing costs of health care plans; lack of a qualified workforce or the loss or retirement of key employees; occurrence of work strikes or stoppages and increasing personnel costs; NextEra Energy's ability to successfully identify, complete and integrate acquisitions, including the effect of increased competition for acquisitions; environmental, health and financial risks associated with ownership and operation of nuclear generation facilities; liability of NextEra Energy for significant retrospective assessments and/or retrospective insurance premiums in the event of an incident at certain nuclear generation facilities; increased operating and capital expenditures at nuclear generation facilities resulting from orders or new regulations of the Nuclear Regulatory Commission; inability to operate any owned nuclear generation units through the end of their respective operating licenses; liability for increased nuclear licensing or compliance costs resulting from hazards, and increased public attention to hazards, posed to owned nuclear generation facilities; risks associated with outages of owned nuclear units; effect of disruptions, uncertainty or volatility in the credit and capital markets on NextEra Energy's ability to fund its liquidity and capital needs and meet its growth objectives; inability to maintain current credit ratings; impairment of liquidity from inability of creditors to fund their credit commitments or to maintain their current credit ratings; poor market performance and other economic factors that could affect NextEra Energy's defined benefit pension plan's funded status; poor market performance and other risks to the asset values of nuclear decommissioning funds; changes in market value and other risks to certain of NextEra Energy's investments; effect of inability of NextEra Energy subsidiaries to pay upstream dividends or repay funds to NextEra Energy or of NextEra Energy's performance under guarantees of subsidiary obligations on NextEra Energy's ability to meet its financial obligations and to pay dividends on its common stock; and effect of disruptions, uncertainty or volatility in the credit and capital markets of the market price of NextEra Energy's common stock. NextEra Energy discusses these and other risks and uncertainties in its annual report on Form 10-K for the year ended December 31, 2013 and other SEC filings, and this press release should be read in conjunction with such SEC filings made through the date of this press release. The forward-looking statements made in this press release are made only as of the date of this press release and NextEra Energy undertakes no obligation to update any forward-looking statements.